Tuesday I listened in on the RighScale webinar: How to Build Scalable Websites in the Cloud. This is part two of my thoughts and notes from the event. (Note: it doesn’t look like it’s been posted yet but it should be available here soon). The clouds providers that Right Scale works with. 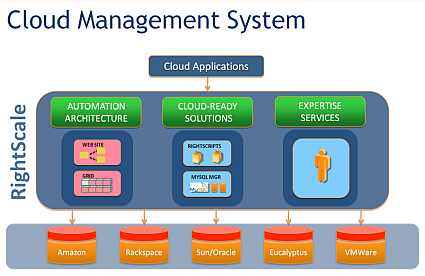 As I discussed last time, RightScale acts as a management platform between cloud providers and Apps. Which Cloud Providers do they work with? If you double click on the IAAS bit in the yesterday’s slide you get something like the above. Right Scale works on top of Amazon, coming soon to Rackspace’s Slicehost, Sun/Oracle’s cloud), Eucalyptus theEC2-compatible open source alternative that allows you to set up “private clouds” (BTW as anyone who attended Austin Cloud camp knows I’m using “private cloud” under duress, Gordon Haff does a good job explaining my heartburn) and VMWare. 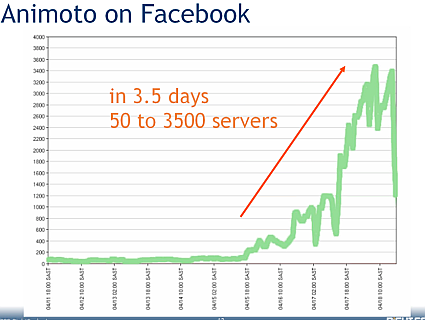 Animoto, the well used example of how server demand can explode. Why do you look to the clouds? It was interesting to see that cost savings came in a close second, its always hard to measure particularly over the long haul but the perceived cost benefit is definitely strong in most folks mind. 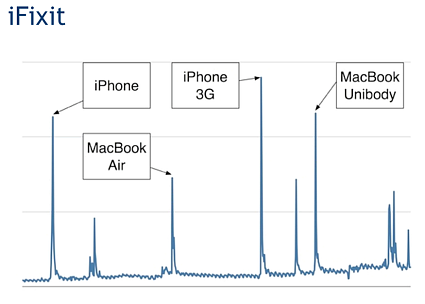 iFixit's traffic could be said to be a tad "spikey." And in conclusion…I’m always intrigued with the way English language morphs and evolves so I thought it was really interesting how the word “vote” is being used in the cloud (or at least by RightScale). Basically they use a “voting process” when scaling. Here’s how one of their team explained it. Once a machine hits the scale up threshold it places a vote to scale up. When enough machines vote to scale up i.e. 51% if that that is what the decision threshold is set at, then new servers are provisioned and configured. The same goes for scaling down. Don’t know if this usage is new or a throw back from mainframes or from some other industry but I like it. This entry was posted on Thursday, June 18th, 2009 at 1:16 pm and is filed under Uncategorized. You can follow any responses to this entry through the RSS 2.0 feed. You can leave a response, or trackback from your own site.